We headed up to Minnesconsin on December 22nd for a quick trip for the holidays. We did Christmas with my immediate family on the 23rd and it was a lot of fun to see the niece and nephew open their gifts. Each couple made some appetizers and we enjoyed sangria that we kept nice and cool outside the backdoor. Christmas Eve was the traditional dinner with my extended side of the family and I got a nice photo of the oldest and youngest members of the family, so sweet. We then spent the next couple of days with Austin's family and I got to watch my other nephew tear into his gifts. We also had time to visit while sipping coffee/tea and my sister-in-law and I sneaked out for a fun girls' lunch with a friend (and now my SiL's coworker!). It was a wonderful visit but Stinky was the only one who wasn't pleased. We got lots of sass when we returned and he still is quite clingy. It must be difficult to be a cat but at least he gets to spend New Year's Eve with us. I'm hardly a "food blogger" but rather a person who sometimes blogs about food. Nonetheless, I was able to join in on this very cool, nationwide cookie swap that also benefited a children's cancer organization. I sent out three packages of cookies and in return, received three different packages of cookies that included apple snickerdoodles, Nutella chocolate chip, and white chocolate dipped gingersnaps. All were so tasty and I also have this thing about getting real mail and packages. 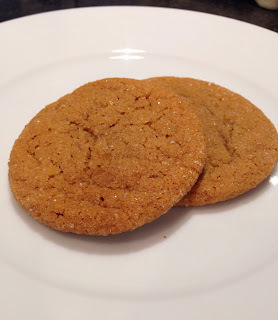 For my contribution, I made chewy gingersnaps. They might not be the cutest little cookies but they are so delicious. Here is the recipe for about five dozen. You can also swap around the spices to your liking though I wouldn't skimp on the cinnamon. I've used some leftover pumpkin pie spice mix before when I was out of nutmeg and that worked. In a mixing bowl, cream butter and sugar. Add the eggs, one after the other, beating well after each addition. Beat in molasses. Combine flour, baking soda, cinnamon, ginger, cloves, salt, and nutmeg; gradually add to the creamed mixture. Refrigerate one hour or until dough is easy to handle. Roll into 1 inch balls; roll in sugar. Place 2 inches apart on an ungreased baking sheet. Bake at 350 for 8-12 minutes or until puffy and lightly browned. Let cool one minute before moving to wire racks. Yep, it's taken me until almost halfway through December to post this but I wanted to share our tried-and-true Thanksgiving menu items. Brined Turkey Breast: We haven't hosted enough people to do a whole bird but brining the breast works just fine. This is the juiciest, most succulent bird recipe, hands down. If you know Austin, you know that he's got it down to a science and lots of research has gone into this process. If you're a meatatarian, you absolutely have to give this a try. Creamy Mashed Potatoes: These are so decadent, they really should be eaten once a year. They include cream cheese, sour cream, butter, and sharp cheddar. American's dairyland in one dish! Green Beans with Toasted Hazelnut-Lemon Butter: If you need something lighter after those potatoes, these beans will do the trick. We used haricots verts for a little more elegant touch. This is a great side dish that can be used for many occasions. Blackberry Cobbler: Instead of the traditional pumpkin pie, Austin couldn't resist making this dessert. We use this as a baseline recipe but add some Amaretto to make it taste (almost) exactly like the legendary blackberry cobbler from The Salt Lick and of course we serve it with vanilla ice cream.